GW students have the added option to reside on one of GW's owned and operated on-campus Greek houses for the summer months. Many chapters that have on-campus Greek housing during the academic year, also have availability during the summer season. Our different Greek summer housing options for GW undergraduates vary by location. All Greek housing options are available to be reserved as a Summer I only stay, a Summer II only stay, or as an Entire Summer stay. If your Spring 2019 or Fall 2019 housing assignment is in any of these buildings, and you choose the same building and room type for your summer assignment, the Greek House Manager of the specific chapter has the option to manually reassign you to that room. This is in an effort to prevent you from having to move multiple times during the transition between Spring, Summer, and Fall Semesters. All rates are for the date ranges specified below. These date ranges are firm and based on the GW academic Summer Sessions terms. GW undergraduate students are not subject to the 14.95% DC Accommodations Tax. A $75 Administrative Fee will be added to the total cost of housing with each reservation. Contact the House Manager of the chapter with which you would like to live and alert him/her of your interest in living in the chapter's house for summer. Apply online through our Summer Housing Application Portal and choose the appropriate chapter house after selecting the GW-operated Greek housing option. 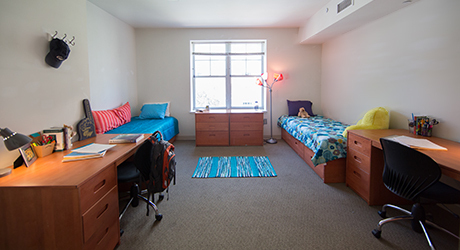 After signing up, the House Manager will be notified of your application and will be required to approve/confirm your reservation made to GW Housing. If the chapter does not approve your housing reservation, we will arrange alternate housing in one of our residence halls based on your initial housing request (alternate housing may require an additional cost). While GW has many more affiliated Greek chapters, only those listed above have on-campus housing that is managed and maintained by the George Washington University and is available for reservation through GW's Summer & Conference Housing Program.